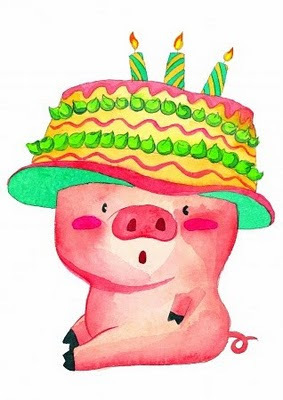 Piggy's Little Shop: Happy Birthday to ME! Had a wonderful brunch at the Riders Cafe which is next to a stable of horses and a horse riding school. It's just so serene and peaceful having my crabmeat vin blanc pasta and watching the horse trotting by. I was with my hubby of cos. You may be surprised but this is a rare sight in Singapore to find a place like this. I just received 6 books (hurray!) from my sister who's in Sydney. I love her to bits. These books just made my day! You are naturally industrious and self-sufficient. For those you love, you will exert all your energies toward making them happy. You are very affectionate, especially intuitive, somewhat psychic, and never enthusiastic. It's quite true for me. It takes alot for me to be enthusiastic. Is it true for you? Happy Birthday, it sounds like you had a great one! YAY :) HAPPY B.DAY TO YOU!!!!!!! :)T.
Happy Birthday Piggy. Sounds like you had a great birthday.